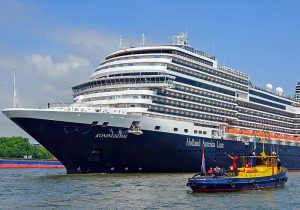 Holland America has done something amazing. It has successfully meshed 144 years of maritime history with new design, entertainment, and culinary offerings on its new Konigsdam. In fact, the ship brings an entirely new look to the Holland America Line. The Konigsdam was launched in Europe a little less than a year ago. At that time Queen Máxima of the Netherlands officially named the ship in the port of Rotterdam. In early November Konigsdam sailed into Florida’s Port Everglades for a winter season of Caribbean cruises. She will return to Europe in the spring. I recently cruised aboard this marvelous ship and found it wonderful. Just consider, for example, the showroom, dubbed World Stage, where I saw an outstanding BBC World production. “Holland America Line cruises are all about experiential travel and venturing to all corners of the globe, and this exclusive partnership with BBC Earth will make that a richer, more rewarding experience for our guests,” said Orlando Ashford, Holland America Line’s president. 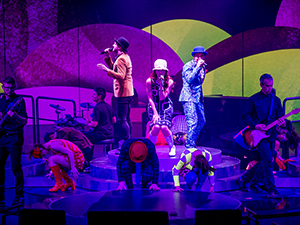 World Stage also hosts comics and musical productions featuring the terrifically talented Konigsdam singers and dancers. Moreover, just a few shorts steps away you’ll find Lincoln Center Stage. It features talented musicians performing classical music and, perhaps, a touch of Latin tunes. 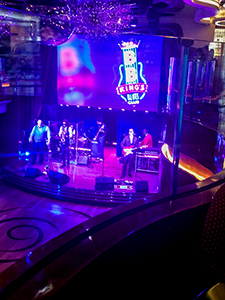 Then it is on to BB King’s All Stars where blues reign supreme, and Billboard Onboard with pop music from the 1960s on. Keeping with the message, you’ll also find music playing a role in the décor throughout the ship. As a matter of fact, even the decks are named Gershwin, Mozart, Schubert, and Beethoven. 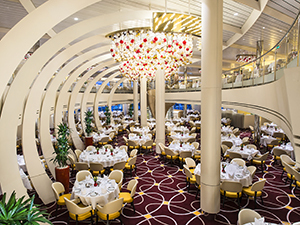 Just as the music venues heralds a new era for HAL, so does several new dining experiences aboard Konigsdam. Award-winning Holland America Line’s Master Chef Rudi Sodamin, working closely with the line’s team of highly regarded international chefs, develops all menus. 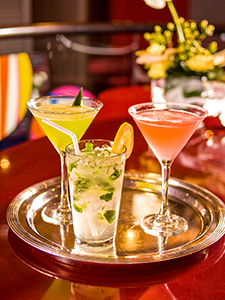 For example, Tamarind, a pan-Asian restaurant, and the popular Pinnacle Grill are featured on many HAL ships. Most noteworthy is the brand new is the Food & Wine magazine-sponsored Culinary Arts dining room with a state-of-the-art open kitchen. The restaurant is an offshoot of cooking classes HAL launched in its fleet about ten years ago. Another exciting and innovative eatery is Sel de Mer, a French seafood dining room that is excellent! The Italian-style Canaletto serves family-style dinners. The redesigned Dining Room has a more modern fashion. Classic Lido Market has developed into many interesting stations and provides three very different meals a day. The new stations offer fresh and inviting ethnic items, as well as sandwiches and salads. The New York Deli is one of the most favorite new additions, but the wait for a Reuben sandwich was way too long. 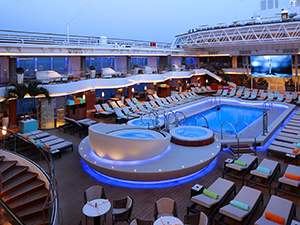 Dive In, on the Lido Deck, features hot dogs and hamburgers and lovely crispy fries. The Dutch Café is ideal for a snack, coffee or a cup of tea with lots of Dutch treats. The café is also new with the Konigsdam and very much like something one might enjoy in Amsterdam. Alternate restaurants charge a per-person fee. 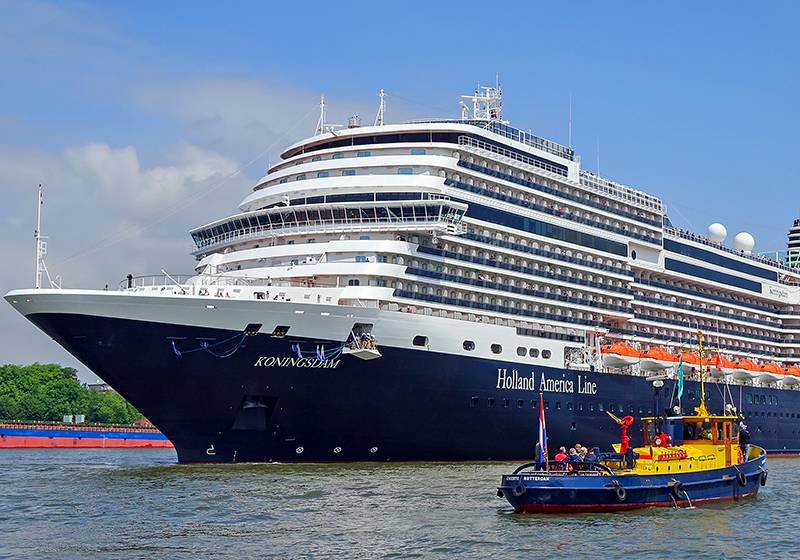 Holland America, however, hasn’t thrown out the baby with the bathwater. Be on the lookout for a decidedly 21st-century décor aboard the ship. As a result, prints of old sailing vessels, 17th-century maps, and other artifacts have been replaced. Also look for modern versions of the classic blue-and-white Delft tableware, and more chrome throughout. Expect a modern, trendy feel to furnishings and soft goods designed to appeal to a younger demographic. Club Hal, the line’s children’s program, offers a magnificent, group of colorful play areas for kids as young as two and up to 17. Fanciful and attractive, pillars look like paintbrushes, a paint can is a play area, and kids can slide down a massive tape dispenser. Tweens 8-12 have their area with choice video games, Xbox 360 and age appropriate activities. Teens have The Loft, a special place where the 12-17 set can hang out. Daily activities range from scavenger hunts to dance parties, and movie and pizza parties. Moreover, Club HAL staff all have college degrees. Celebrating a major family event? The line offers incentives for family reunions booking eight or more cabins. Furthermore, the ship offers many adjoining cabins. In the first place, HAL cabins are some of the best designed at sea. As a result, two people will find plenty of room – with cabinets left over – for a multi-week voyage. Moreover, 12 single cabins are also available. All cabins include flat-panel televisions, a DVD player, in-room safe, mini-fridge, and telephone. A full-service spa features many traditional – and some new trendy treatments – geared to make you feel great. In addition, a hair salon and state-of-the-art fitness center round out the bright, airy complex forward on the Lido Deck. Varied classes are offered daily. Duty-free shopping is available aboard ship. Of course, The Daily Navigator, the ship’s newspaper, lists operating times for all venues: restaurants, shows, classes, the casino, and shops. All the lines are going with Specialty Restaurants while “dumming down” the entree selection in the main dining room. Would have liked to see your take on the menu selections in the main dinning room rather than how nice it is to pay extra to eat! The main dining room selections include fish, steak, chicken as always available, yet offer some interesting pasta dishes and meat and seafood specialties. The service in the main dining room is pretty spot on, as well. Not everyone wants an alternate dining experience each evening, but trying one or two in the course of the week can be fun and “special”.